There is a particular magic to mythology. I admit, I have a complicated relationship with the word magic. I’m a fairly pragmatic person, and I tend to lean toward a definition of magic as “science we can’t yet explain.” So whenever I work with myths and stories, or magical concepts, I tend to break them down and look at their function, or look at the sociology and history that created them. 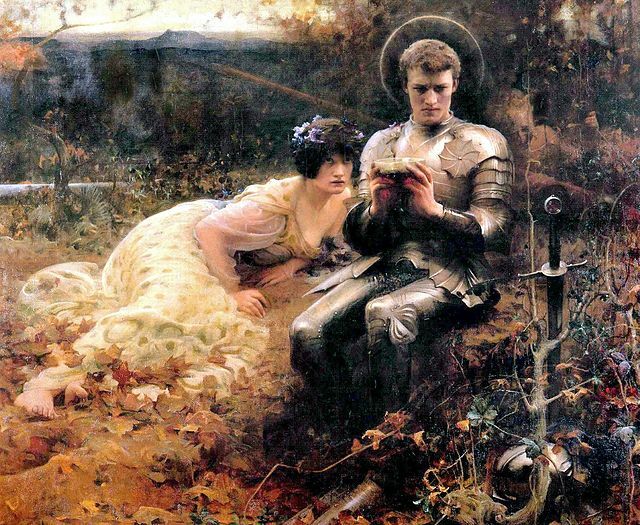 I find the stories of the Quest for the Grail to be especially inspiring because they feel very relevant to the work of personal seeking and of building community. For example, when I look at some of the ideas surrounding magic, sovereignty, and the land, I think first of fertility magic. Do I believe that humans (particularly sovereigns) need to make love in the fields in order to bring fertility to the crops? I’d have to say no. I also think about the physical object of the Grail. Do I think there was some magical cup or dish that healed the sick, gave immortality or wisdom, or fed people what food they liked best? Probably not. For that matter, do I believe that there was some historical king who was wounded and who thus caused the sickening of his own land? 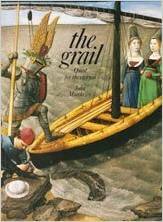 It’s possible there was a historical king that was woven into the story of the Grail and the wounded king. For me, that isn’t the important part. What’s important for me is that I see the story of the wounded king play out with people I know in everyday life. When the king — the sovereign, the leader — is ill, the people suffer. I believe that when we look at the story of the wounded king and the wasteland, we’re onto something real at a core level. The word “myth” sometimes bears the connotation of “a story that isn’t true.” I tend to look at myths from the perspective that these are enduring stories. They are true not because they happened exactly as told, but because they reflect human nature. By looking back at these older stories, we can learn a lot about ourselves and our communities. There is a saying in the Grail romances. “The land and the king are one.” Or, more specifically, when the king is wounded, the land suffers and the people suffer. I don’t need to believe that there is some magical link between the fertility of the land and the health of the king to see the truth in this statement. Think of “the land” as a metaphor. For example, think about your experiences with different organizations. Perhaps a grassroots activist group, a Pagan group, or even a corporation. Think about any group out there with a leader who is harming their group members, a leader who is stubborn and intractable, a leader who is a jerk. That leader you hate dealing with. That abusive leader. That leader that you know sexually abused their students. That leader who has many red flags for a one of the major personality disorders who is consistently engaging in harmful and destructive behavior. When the leader is ill — when the leader is acting in unhealthy ways for themselves and their group — the group suffers. And when the group suffers, that sickness spreads out to the larger community around them. The land and the king are one. A wounded sovereign is one of the reasons many groups fail. A few of my mentors used to say, “Your group cannot be any healthier than your leader,” and I’ve seen that be true much of the time. But what is the wound? I resonate with that in my own experiences; depression and the wasteland sound a lot alike. And I also see the attempts to feel better that not only fail, but often cause more problems. When we are hurt and unhappy, we act in ways that hurt ourselves and others. One of my depression coping mechanisms is avoidance, which usually digs my life into a deeper hole that’s harder to get out of. When I think about the wounds of my past and how they impacted me, what I think about is that sense of insecurity I was left with. Growing up, I was the fat kid with acne. I coped by reading fantasy novels, and then writing my own stories. I coped by shutting off my emotions so that I wouldn’t cry when I was bullied every day. I coped by being smarter than everyone else, or at least, trying to be. Having been verbally and emotionally abused by my peers, I retreated into my own world. I tried to gain what power I could with the only means available to me. I had my brain, and I was a loner and a know-it-all. The daily bullying I endured in school left me with little true self confidence and with terrible self esteem. I was convinced that most people hated me, and the evidence of how I was treated seemed to back that up. Whatever your own wounds are, you probably found a way to cope. However, the irony is that often the way we cope with these wounds can cause us more grief down the road. If you’ve ever been around a know-it-all, you know how annoying they can be. In my early twenties, I lamented how people didn’t like me, but eventually I came to realize that I wasn’t being rejected any more just because I was fat. I wasn’t even around the people who had bullied me in school. I came to realize that one of the core reasons I was being rejected was because I was arrogant, a know-it-all, and a socially awkward introvert. I see this so often in the small group leaders who cause their own problems. They are egotistical, standoffish, angry, or overdramatic. Some are bullies, others desperately seek positive attention, still others seem to relish in online and in-person battles where they seek to prove someone else wrong at all costs. So what heals this wound? The truth is, some wounds can be healed, and some cannot. Some of the wounded leaders out there have been harmed in the past but, through a process of self reflection and other personal work, can recognize their poor behavior and seek to correct it. Some of the wounded have deeper issues for which there is no cure, including some of the major personality disorders like Antisocial Personality Disorder (psychopaths and sociopaths). Narcissistic Personality Disorder is another mental illness that often defies treatment. The narcissist typically acts in an arrogant, grandiose manner to disguise a core truth — they hate themselves and are convinced that everyone hates them. Unable to deal with that horrible idea, they prop up their egos by surrounding themselves with admirers, by bullying others, by always being “right.” Narcissists lack empathy for others. Wikipedia offers some basic overviews of Narcissistic Personality Disorder (and other disorders as well). Narcissistic Personality Disorder itself is difficult to treat in part because so few narcissists will actually admit they have a problem and seek treatment. However, I find that exploring the connection between narcissism and wounding is useful because so many leaders causing their own problems have many traits of narcissists whether or not they meet the full diagnostic criteria; they display the arrogance, superiority, and attention-seeking behavior. And in many cases, that behavior covers up a deep fear of inadequacy from some experiences of their past. I’ve looked into this dark mirror myself. I’ve seen the places where my own horrible self esteem from those old wounds left me with coping strategies that harmed me in the long run. Feeling unloved, unwanted…hated even, I retreated into arrogance and perfectionism. I knew people wouldn’t ever like me, of course, but they liked my artwork or design work. They didn’t like me, but they liked the events I planned. They didn’t like me, but they liked what I could do. So everything I did had to be perfect. It wasn’t until I had a narcissistic boss that I realized I did many of those things. That my own behavior was turning people off, even though so much of what I did was in an attempt to be valued, respected, and accepted! There are many different types of wounds, and thus, many dark mirrors. However, narcissism is a crucial dark mirror especially for sovereigns — for leaders — because so many narcissists gravitate into positions of leadership. And small, volunteer-run groups are easy structures for a motivated narcissist to gain power and status. And so when a group leader has narcissistic behaviors, or any other harmful behaviors, the group cannot be healthier than the leader. All of us within the umbrella of Pagan communities need to look at our behaviors. What behaviors are we engaging in that are harming ourselves and our groups? Why do we engage in those behaviors? I think we’ll often find that we’re acting out of pain from our past. In essence — part of the healing of the wound is looking into the dark mirror. We can’t heal the wound until we acknowledge we’ve been hurt. When we’ve piled on the defenses to avoid the pain of our past, that can be the hardest step. In the Twelve Step program, this is part of the beginning of the process. While I have some issues with aspects of the Twelve Step program, I absolutely agree with the concept that we can’t begin to address the problem until we acknowledge there’s a problem in the first place. When we look at our own behavior, and when we look at what happened to us in our past that led us to that behavior, we can begin to transform. That’s part of it. I also believe that there is an inherent power in the mystic union with the divine. Whether you call this God, the divine, the deep self, or by the name of a specific deity, there is something about that opening, that connecting to something larger, that is healing. If one of the side effects of wounding is a shutting off from emotion/love/grief/joy/sorrow/ bliss/hope, then opening to that larger something, to those emotions, can be part of the cure. In acknowledging the wound, we find the key to healing. In asking who the Grail serves or how we can serve the Grail, we are asking how can we serve the divine, how can we serve our community, our land, our groups. And when we offer that service in love, we are healing not only ourselves but community too. The Grail is, at its essence, a water-bearing vessel. Changing the vessel releases the waters and allows them to flow where they are needed to heal the wound. The concept of the ego can be thought of as a cup. A healthy ego has boundaries and holds water. An ego that has been wounded spills the water out and doesn’t allow the cup to ever fill. I’ve written many articles about how a group member, or a leader of another group, cannot “make” a bad leader stop leading a group. We can shun them. We can speak out about their abuses and bad behavior. But unless someone has done something illegal and there is proof, each leader is indeed their own sovereign. We have no power to stop them. To these leaders we can offer leadership training and techniques, including looking into the dark mirror as well as resources for healing those wounds from the past. Here are a few things I’ve observed in my years of teaching Pagan leadership. The leaders who are causing the most problems are paradoxically the least able to recognize their own flaws, and the least likely to try to change their behavior. On a similar vein of unfairness, those leaders who most need help are the ones who are least able to afford to bring in professional training. There are a number of reasons for this. One is that many of these are leaders who live in economically depressed areas, which also can be a factor in what kind of education they had access to. What I’ve found is that groups with leaders who had access to more and better education seem to have less drama. This is just my own anecdotal experience, and I wish I had a team of anthropologists to unleash to gain quantitative and qualitative data on this. But what I’ve seen over and over is that groups that have the benefit of leadership training, a stable venue, and mature, educated leaders are among the more stable groups out there. The land and the king are one. Healthy leaders create healthier groups. We don’t need to be the sovereign of a group to seek our own inner sovereignty. We don’t have to lead a group to find the leader within ourselves, or to seek inner wholeness. We all have wounds, and we all are wounded kings. We all have behaviors that are unintentionally harmful to ourselves and to those around us. What is wholeness and healing? Some healing can come simply from opening up to that larger divine. Some healing can come from a process of therapy. Some healing can come just from being loved and being touched. Those who are loved and accepted often find healing for those old wounds of rejection. In fact, the simple agency of physical touch—of being held and comforted and accepted physically—can have a beneficial effect. More than anything, though, I believe that the quest for wholeness is served by exploring ourselves. First, looking into that dark mirror, but then also looking at what we do well. What are our gifts and talents? What are our dreams? What are the ways that we bring love out into the world? Answering these questions requires our own individual journey. Jill Purce writes in The Mystic Spiral: Journey of the Soul that “The spiral tendency within each one of us is the longing for and growth towards wholeness. Every whole is cyclic, and has a beginning, a middle and an end. It starts from a point, expands and differentiates, contracts and disappears into the point once more.” I so often think of the journey of the Grail quest, the pilgrimage path that follows a labyrinth or spiral into the center and back out again. I look at this process as the core of most of the rituals I facilitate. I believe that if I can help people crack open their hearts to that larger divine, or their deepest self…really, whatever they call it isn’t important to me. I’m there to help people open up to that something beyond that has healing and transformative properties. That connection is like the Grail itself — it pours those waters of grace, of love, of connection into our hearts. Wholeness is healing from the wounds of our past, but it’s also looking at our future. It’s asking the question, what do I serve? And how can I serve the Grail, that larger divine? How can I serve my community and the world around me? The land and the king are one. What can we — each one of us — do to make ourselves and our communities healthier?